Located in the Upper Peninsula. 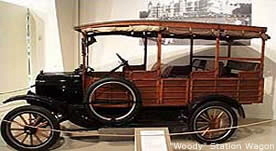 The production of the "Woody" station wagon bodies and the conversion to glider production during World War II highlighted Henry Ford's accomplishments in Kingsford. This is where the Kingsford Charcoal Briquettes started. Now home to a number of diverse industries and small businesses with a progressive climate for expansion and growth. Looking for a quaint cottage on a lake or log cabin in the woods? Need something that accommodates the whole clan? Start making your plans now so you won't be disappointed. Michigan offers a host of delightful lodging choices to make you feel right at home, away from home. Most cottages and cabins are located near lakes for great water sports, or close to trails for hiking, biking and snowmobiling. Cook your own meals or dine out at local eateries and pubs. Bring a good book, games for the kids and watch beautiful sunsets or enjoy the sunrise for another day together. To start your planning, here are our listings of Cabins & Cottages in and around Kingsford, Michigan. Sorry, we have no listings in this community at this time.